- Tangled Threads -: Something old and something new! Sooo...the tea sampler is finished, now do I complete one of my UFO's or do I start something new? Mmmm....decisions, decisions. What if I do both......no guilt and satisfaction....what could be better! Teehee. The top panel of Max (there's three altogether) is back stitched and looking good. It's another lighthouse design.....you know how I love anything to do with the beach and lighthouses! This one is stitching up extremely quickly. The sky is made up of only half stitches so I feel like I accomplished so much in just one week. The bottom part of the design has mostly full cross stitches so won't be completed quite so quickly. My plan is to do another panel of Max before I do any more of the lighthouse design.....and since I really want to work on the lighthouse, Max will be done! The pattern for the helmets can be found here. We found that the hats were a bit too large so we adapted the pattern a bit so that they fit better. They were fun to make and I have to say they were a HUGE hit on Christmas eve....well worth the effort. Max looks really good with the backstitching. And the lighthouse design is very beautiful, glad it is stitching up quickly. Max looks terrific and I really like the lighthouse. Love the viking helmets - those beards/moustaches are wonderful. Nice new start as well! Work on an old one, start a new one, my favorite plan. Everything looks great. Max looks adorable with the backstitch. Pretty new start. The new lighthouse start looks so promising and you've done a lot on it already! 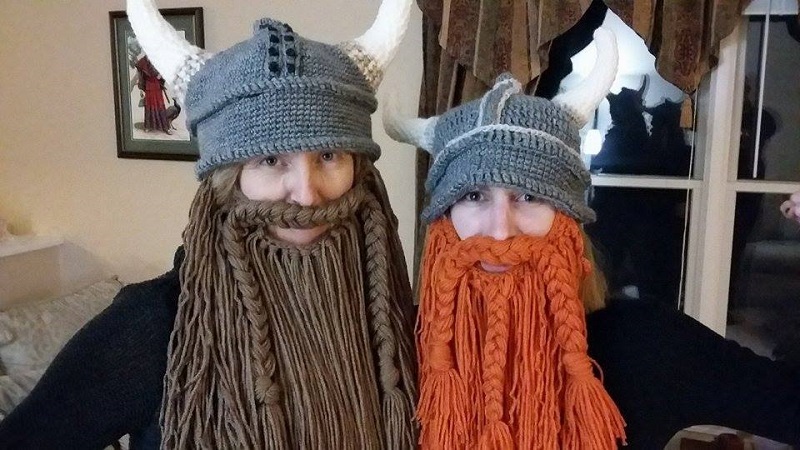 Love the Viking hats & beards, hilarious!!! Great job on both pieces. Max looks fantastic with backstitching. I just LOVE the viking helmets. Too cool!! 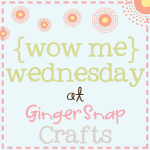 Your stitching is fantastic, love the new start!! Those helmets are amazing! Absolutely love them, must watch that video when I have a chance. What a great post! 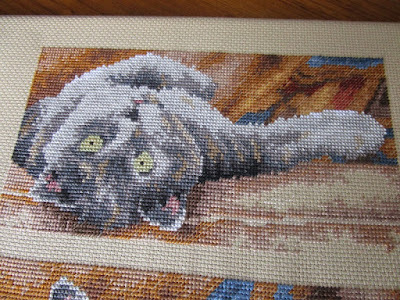 Max is looking fabulous with his piercing backstitched eyes and you've stitched so much for your gorgeous new start. 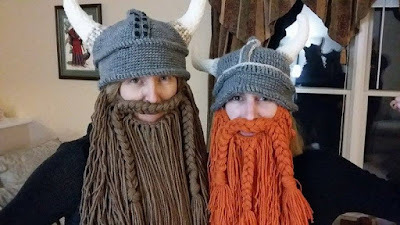 The Viking hats and beards are so funny! A great gift idea. Ha love those helmets! 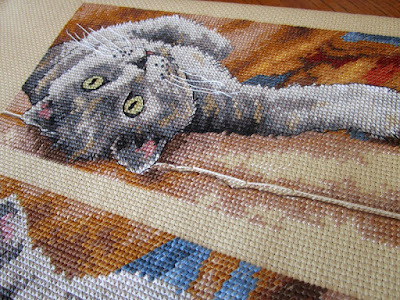 And your cat cross stitches are gorgeous! I'm trying to catch up on wips too but not doing very well! 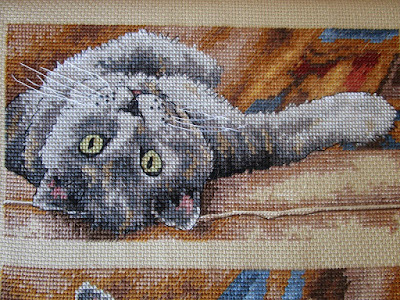 Wonderful to see how Max the cat is making such good progress...such definition to the design when you added the back stitch, it looks great. 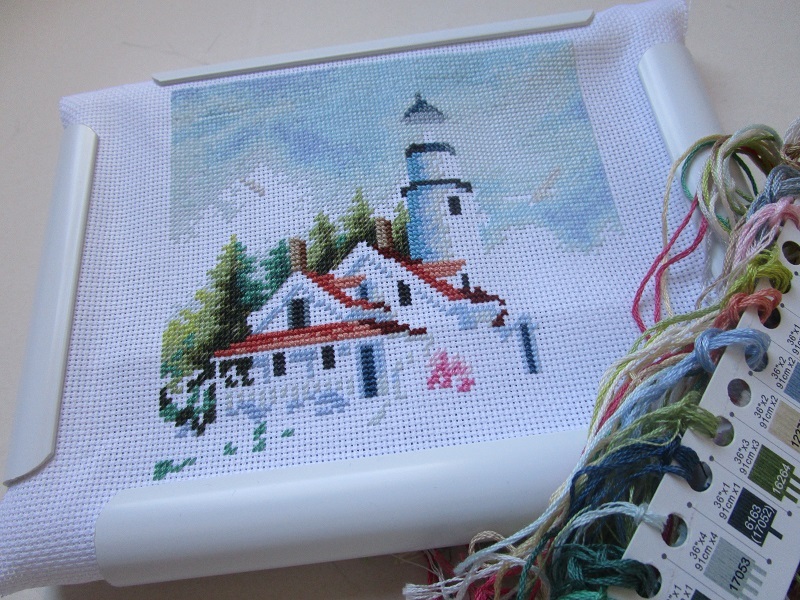 I love lighthouse and beach themes too and your new lighthouse cross stitch is delightful! And those Vikings...wow, how amazing they look and such a fun project! !